It’s been awhile since the investment world truly had a revolutionary player. After all, the NYSE was founded more than 200 years ago, today’s highest volume stock (General Electric) came to be in the late 1800s, and even the more volatile Forex markets will celebrate their 20th anniversary soon. So compared to most traditional investment vehicles, Bitcoin is an absolute newcomer to the market. Founded in the late 2000s, Bitcoin’s open source code was released into the world in January of 2009 – and not a whole lot happened in the three years following the release. Then, Bitcoin began to see some traction, and trading volume figures have ballooned over the past five years to unprecedented levels. So Bitcoin is growing, it is gaining in popularity, and it is certainly gaining in value. So the real question becomes, how does Bitcoin compare to traditional investments? Let’s take a look. To establish the comparison, let’s present the key pros and cons of Bitcoin. First, high returns are possible due to the volatile nature of this specific cryptocurrency. Risk levels tend to be high, too, as there is no governing body overseeing the trading and valuation of Bitcoin. And, there is nothing to back up the value of Bitcoin except for general consumer confidence and interest in the product. Anonymous investors will like the fact that, for the most part, you don’t have to associate yourself with your Bitcoin account – you can trade using a pseudonym. It can also cost very little to purchase Bitcoin, but liquidity can be a concern if you need cash quickly. Now, let’s look at some other investments in comparison to Bitcoin. 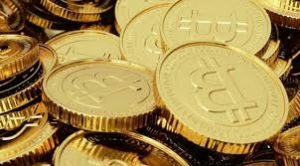 Precious Metals: This category offers a unique counterpoint to Bitcoin, because it is an investment vehicle that offers something truly tangible to back up the investment. Gold, silver, platinum and other precious metals have shown bullish growth over the past several decades, with far fewer abrupt market corrections than investors lived through with the stock market. Gold and other precious metals will deliver low to medium returns, but offer basement-level risk, easy liquidity (gold is a universal item of value around the world) and a low buy-in entry point. Gold has long been considered as the perfect hedge against market instability, political turmoil and global conflict. Bonds: Bonds are one of the safest investments available, posing less risk to the cautious investor. They’re easy to obtain and entry costs are as little as a few hundred dollars, but the returns are historically about as low as they’ve ever been. There is no anonymity with bonds, but they are pretty easy to liquidate. It isn’t a bad idea to balance your portfolio with bonds, but don’t expect them to account for any serious gains, even over many years. Stocks: There is no way to predict the performance of a specific stock, though the market has done pretty well throughout history – especially if you’re willing to hold your positions for a long time. Most mature stocks will deliver single digit returns each year, at best, with some startups or specific industries posing the upside of bigger gains tempered by much higher stakes. There is no anonymity with stocks, but they often require less money to purchase (with exceptions, of course) and liquidity is quite high – especially for mid-large cap stocks. Cash/Savings Accounts: When only inflation or deflation and a small percentage of interest is your profit driver, you know you’re talking about a safe, yet very low performing, investment account. This category includes vehicles like money market accounts, certificates of deposit, and savings accounts. Even a savings account driving 0.50% interest each year won’t outpace historic inflation levels. The good news? Many of these accounts are FDIC-insured, won’t lose value, and are completely liquid. You might see an interest penalty if you withdraw funds from a specific-term CD, but you’ll always have access to your money. Cash accounts (money market, CDs) are the safest bet because they’re generally federally-insured. The downside is they make almost no money. Gold offers the only real tangible representation of value. Bitcoin is unproven and volatile, and represents significant risk on the part of the investor, and bonds are very low risk but equally as low in terms of reward. The only investment option that offers historically proven returns, tempered risk, global appeal, demand and value, and good liquidity is precious metals – specifically gold. For more information on gold IRAs and other precious metals-based investment vehicles, contact American Bullion today!